Mexican national Alvarez Kelly (William Holden) has brought a large herd of cattle to Alabama in 1864 at the request of the Union army. Now that they’ve arrived, Col. Stedman (Patrick O’Neal), a Massachusetts lawyer in civilian life, insists they go by train to a location outside of Richmond, Virginia. Kelly grudgingly complies and is paid at the Warwick farm. Mrs. Warwick (Victoria Shaw), a southern belle, has arranged for Virginia cavalry (the so-called Comanches, led by one-eyed Col. Tom Rossiter [Richard Widmark]), to steal both Kelly and his cattle, on the theory that the Confederates are a lot hungrier than the Yankees, in part because their money isn’t any good. Rossiter (Richard Widmark) and Kelly (William Holden) negotiate. The relentlessly non-affiliated Kelly is hard to persuade until Rossiter shoots off a finger and threatens to shoot off the others unless Kelly agrees to go along. Meanwhile, in part for revenge because of his mutilated hand, Kelly arranges to help Rossiter’s fiancée Liz Pickering (Janice Rule) escape Richmond aboard a Scottish ship bound for New York. There is a not-terribly-convincing sequence where Kelly demonstrates that regular cavalry men don’t possess the skills to drive catlle. Rossiter instructs Kelly’s watchdog Hatcher to kill Kelly if anything happens to Rossiter. Stedman figures out where Rossiter is heading with the herd and positions his men and a few artillery pieces to stop them at a bridge. Kelly stampedes the cattle over the bridge and into the Black Swamp and on to Richmond. At the end there is a not-terribly-convincing rapprochement between Kelly and Rossiter, and Rossiter even shoots Hatcher to keep him from killing Kelly at the bridge. Rossiter and the Confederates aren’t so good at herding cattle. The story is based on an actual event from the Civil War—Gen. Wade Hampton’s “Beefsteak” raid of September 1864. Holden is good, but was said to be suffering through a particularly bad bout with his alcoholism. Production was held up for six months when Holden contracted salmonella. The stars, Holden and Widmark, as well as director Dmytryk, were said to have reservations about the film’s script, which isn’t all that strong. It’s hard to rehabilitate a character like Rossiter after the shooting-off-the finger incident; usually somebody who’d do that is an irredeemable bad guy, as in The Man from Laramie. Whether the movie works at all depends on the two leads playing off each other, and they’re both excellent actors. Holden and Widmark remained lifelong friends after the filming. 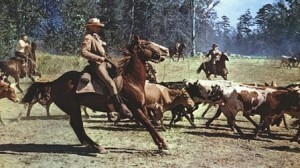 In color, filmed near Baton Rouge, Louisiana, where Steve McQueen was filming parts of Nevada Smith at the same time. Ukrainian/Canadian/Californian Edward Dmytryk, who had been directing movies since 1935 and became known for his films noirs by the end of the 1940s, was one of the “Hollywood Ten” in 1948 and was sentenced to a year in prison for contempt of Congress. Consequently he was among those blacklisted in the 1950s, but he was making his way back by the middle of the decade. 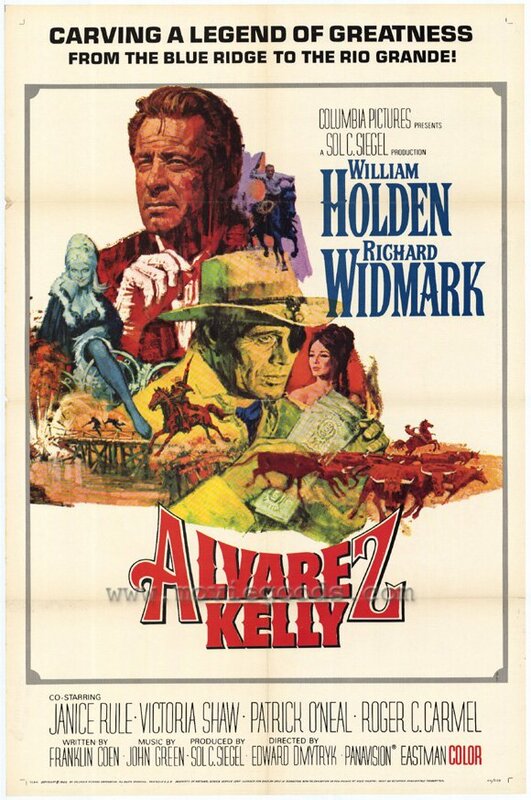 He made only five westerns, the best of which was probably 1959’s Warlock, with Henry Fonda, Richard Widmark and Anthony Quinn. Second would be Broken Lance (1954), with Spencer Tracy and Richard Widmark. But this might be the third best from a good director. 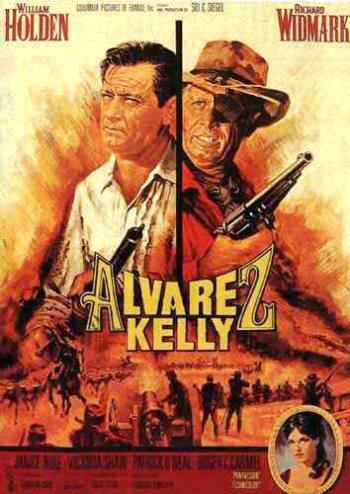 It would make a good double feature with John Ford’s The Horse Soldiers (1959), another Civil War movie, also with William Holden as one of the leads and also with good battle scenes. 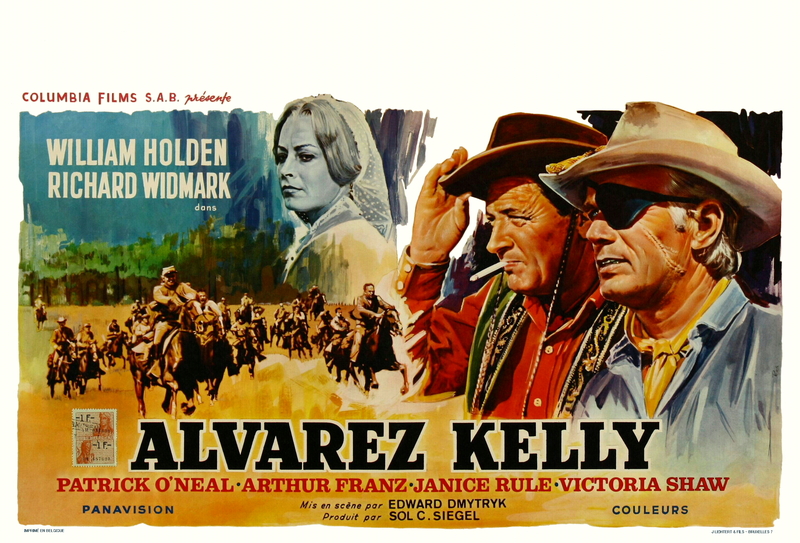 This entry was posted in Westerns Worth Watching and tagged Cavalry Westerns, Civil War, Richard Widmark, William Holden on November 21, 2013 by Nicholas Chennault. My god Widmark is awful trying to portray a southerner….